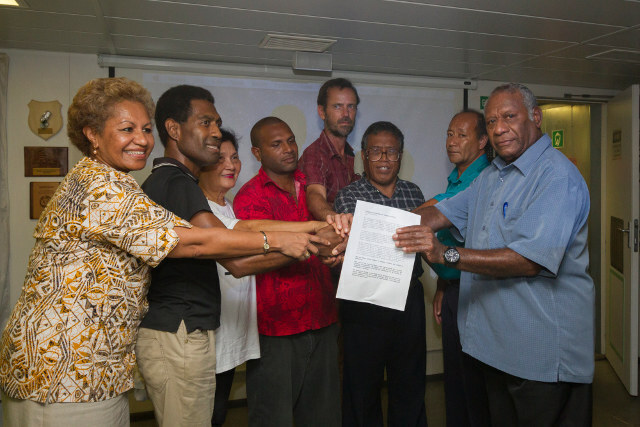 The Pacific Declaration for climate Justice signed by several Pacific Nations on June 8, 2015, threatens legal action to recover damages against major climate polluters. Developed nations and corporations that have contributed substantially to greenhouse gases and carbon pollution enhancing climate change impacts may be subjected to litigation brought by Pacific Island Nations. 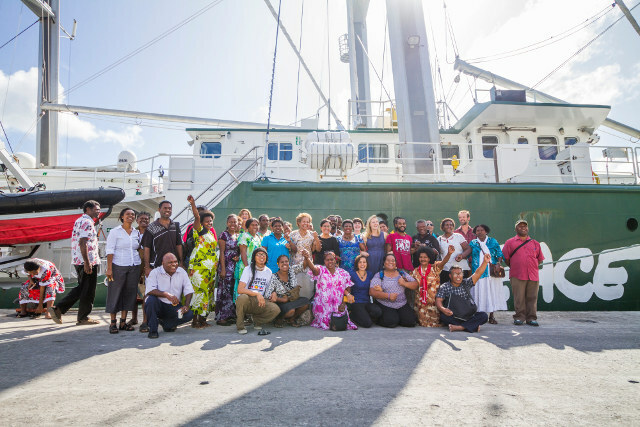 Forty representatives of several Pacific Island Nations gathered in early June on the azure waters of Port Vila, Vanuatu, on board the Greenpeace vessel, Rainbow Warrior. They were attending a Human Rights and Climate Justice Workshop. President of Vanuatu, Baldwin Londsdale, and representatives from Tuvalu, Kiribati, Fiji and Solomon Islands met and signed a declaration seeking "climate justice". They were joined by representatives from the Philippines, including former national climate negotiator Mr. Naderev “Yeb” Saño and the Mayor of Dolores, Samar, Mrs. Emiliana Villacarillo. "It is now more important than ever before that we stand united as affected communities in the face of climate change, rising sea-levels and changing weather patterns. Let us continue to stand and work together in our fight against the threats of climate change," said Vanuatu President, H.E Baldwin Lonsdale. Climate change is already wreaking havoc on Pacific nations through rising sea levels contaminating freshwater lenses and destroying agriculture, and threatening the life and culture of island communities. Stronger storms like Super Typhoon Haiyan that devastated the Philippines and severe Tropical Cyclone Pam that ripped through Vanuatu earlier this year, are likely to get even stronger and more destructive as the climate warms. “Climate change is a borderless issue, gravely affecting millions of people worldwide. The UN Human Rights Council has recognized that climate change has serious repercussions on the enjoyment of human rights as it poses an immediate and far-reaching threat to people and communities around the world. In this light, we view climate change as a social injustice that must be addressed by international governments and agencies, most especially those responsible for contributing to the climate crisis,” said Ms. Zelda Soriano, Legal and Political Advisor from Greenpeace Southeast Asia. Litigation may be brought against the major corporate entities responsible for the majority of global industrial emissions. According to a study published in Climate Change in 2014, 90 entities are responsible for an estimated 914 billion tons of carbon dioxide equivalent (GtCO2e) of cumulative world emissions of industrial CO2 and methane between 1854 and 2010, or about 63 percent of estimated global industrial emissions of these greenhouse gases. “Climate change is not a problem for one nation to solve alone, all our Pacific Island countries are affected as one in our shared ocean. Governments must stand up for their rights and demand redress from these big carbon polluters for past and future climate transgressions. Our climate-impacted communities have a moral and legal right to defend our human rights and seek Climate Justice by holding these big carbon polluters accountable and to seek financial compensation,” said Tuvalu delegate, Mrs. Puanita Taomia Ewekia. Greenpeace Southeast Asia will be submitting a petition to the Philippine Commission on Human Rights requesting the Commission to investigate the responsibility of the major polluters for directly violating human rights or threatening to, due to their contribution to climate change and ocean acidification. A first stage in preparing for climate litigation. “These big carbon polluters have enriched themselves for almost a century with the continued burning of coal, oil and gas. They are the driving force behind climate change. Time is running out for these vulnerable communities and the world’s big carbon polluters have a moral, and legal responsibility for their products and to meaningfully address climate change before it is too late,” said Ms. Anna Abad, Climate Justice Campaigner from Greenpeace Southeast Asia. We, the people of Vanuatu, Kiribati, Tuvalu, Fiji, Solomon Islands and the Philippines continue to experience the impacts of climate change - the single biggest human rights, environmental and humanitarian crisis of our time. It has claimed thousands of lives, displaced millions of people, damaged livelihoods, and caused a severe economic toll in relief, rehabilitation and reconstruction efforts. The burning of fossil fuels by big polluters has been found to be primarily responsible for emitting large amounts of greenhouse gases. The concentration of said gases, especially carbon dioxide in the atmosphere causes climate change. An estimated 25-30% of the carbon dioxide emitted by these activities was absorbed by the oceans, causing ocean acidification. As the people most acutely vulnerable to the impacts of climate change, we will not let the big polluters decide and assign our fate. Our rights and ability to survive must not be dictated by the continued addiction to the burning of fossil fuels. We refuse to accept the “new normal” and demand for climate justice by holding the big polluters and their respective governments to account for their contribution to the climate crisis. Our people and our environment must be preserved for the generations to come. We are from island states in shared oceans. We stand in solidarity. We commit to bring a case that would investigate the human rights implications of climate change and hold the big carbon polluters accountable to appropriate international bodies or processes. So lets have a look at the top 20 corporate and state agencies who share a substantial responsibility for historical greenhouse gas pollution causing climate change. "Most analyses to date, as well as the UNFCCC structure, consider responsibility for climate change in terms of nation-states. Such analyses fit the framework of international law, insofar as treaties and conventions are based on agreements between nation states. However, responsibility can be understood in other ways as well, as done in the present analysis tracing emissions to major carbon producers. Shifting the perspective from nation-states to corporate entities — both investor-owned and state-owned companies — opens new opportunities for those entities to become part of the solution rather than passive (and profitable) bystanders to continued climate disruption." While corporations have financial incentives and fiduciary duty to shareholders to produce and market their booked reserves and oppose efforts to leave their assets in the ground, social and legal pressure needs to be brought to bare to shift corporate incentives. Withdrawal of social licence to operate through divestment, increased government regulation of mining and pollution standards, and litigation efforts are all important in reigning in the power and environmentally destructive financial incentives of these corporations. Climate litigation by Pacific nations or by citizens of developed nations is important for pursuing climate justice for present and future generations. The Dutch landmark case brought by Ergenda foundation against the Netherlands Government with 886 citizen co-plaintiffs resulted in a legal determination that the Netherlands Government has the legal duty to take measures against climate change in accordance with IPCC recommendations. Similar determinations for damages are needed against the corporations responsible for historical climate pollution. Read more, including a discussion of the legal prospects, at Climate Progress: Why These Tiny Island Nations Are Planning To Sue Fossil Fuel Companies. Photo Copyright Steven Lyon / Greenpeace. Used with permission. Human Rights and Climate Justice Workshop in Vanuatu(Left to Right) Emele Duituturaga CEO of PIANGO, Charlie CEO Vang, Emiliana Villacarillo the Mayor of Dolores, Mr. Gary Tuaniasa Frank Solomon Islands Rep, Mike Fincken the Captian of the Rainbow Warrior, Mr. Torote Kauongo President of KiriCan, Mr. Sefuteni Liki Tuvalu community rep, President Baldwin Lonsdale sign the People's Declaration for Climate Justice which solidifies their intent to pursue Climate Justice, especially in the months leading to the Paris COP.